The new BioEngineering building opened in fall quarter on October 19, 2017, and is now home to 15 faculty who will guide graduate students and postdoctoral researchers in a shared laboratory space, providing for new collaborations and cross-discipline directions in problem-solving and discovery. Chemical Engineering’s own Professor Siddarth Dey now has his office and lab in this impressive site. The 45,000-square-foot glass, metal and concrete building was designed by the architectural firm Moore Ruble Yudell, and includes 17,200 square feet of laboratory space. The building includes a variety of “smart” sustainability features including natural light and ventilation, where the offices are located on the south side of the building. And located on the north side are large lab spaces with efficient temperature control features for efficiency. A more centralized location on campus also provides increased access for collaboration. 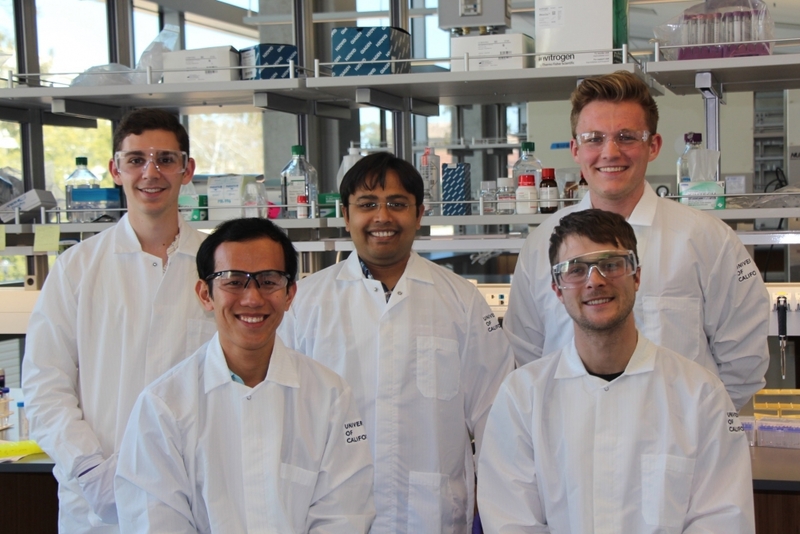 Dey Lab: Rob Jones, Professor Siddarth Dey, Alex Chialastri, and Chad Wangsanuwat, with BMSE rotation student Sam Wilson.